Thousands of football fans rallied in George Square on Saturday and sent a strong message to the Scottish government and Strathclyde police in response to events three weeks ago in the Gallowgate, when almost 200 Celtic fans were kettled as they attempted to march to Celtic Park. Men, women and children defied police instructions over dispersal after the rally and took to the streets with their banners and placards held high. In a non-violent act of civil disobedience, it was clear that the Scottish government and Strathclyde police had lost the respect of thousands of its citizens. Some in the Scottish mainstream media may put a negative spin on that defiance, but history offers a different view on civil disobedience. The suffragettes didn’t bring about change by acting within the boundaries set down by the people who were oppressing them. They are an inspiration for the nation’s young women today. They fought for something that mattered and such battles are rarely won through official channels alone. Fans of Scottish football fear they have become an easy target for Alex Salmond’s Scottish government. However, the first minister must now realise he has an issue when that target is multiplied by thousands, willing to take to the streets and growing unconcerned with official permission. The march was impromptu, passionate, loud and charged through the streets of central Glasgow on behalf, it felt, of those prevented from doing so three weeks ago. And they were. 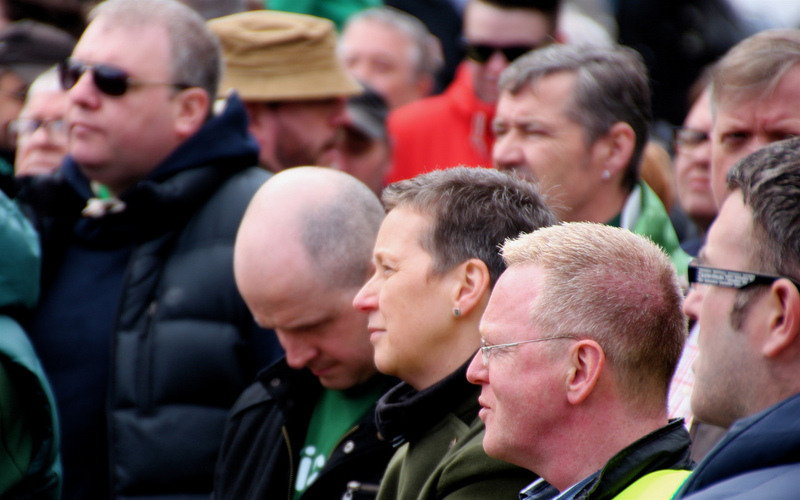 Fans from St Pauli, St Mirren, Motherwell, Dundee United and Hibernian joined the majority number of Celtic fans at the rally and stood in solidarity against the Scottish government’s Offensive Behaviour at Football and Threatening Communications Act. The Scottish justice secretary, Kenny MacAskill, should be paying attention. Football is cultural, it’s not just about supporting 11 men on a pitch. The Scottish government would be foolish to underestimate the power of that. 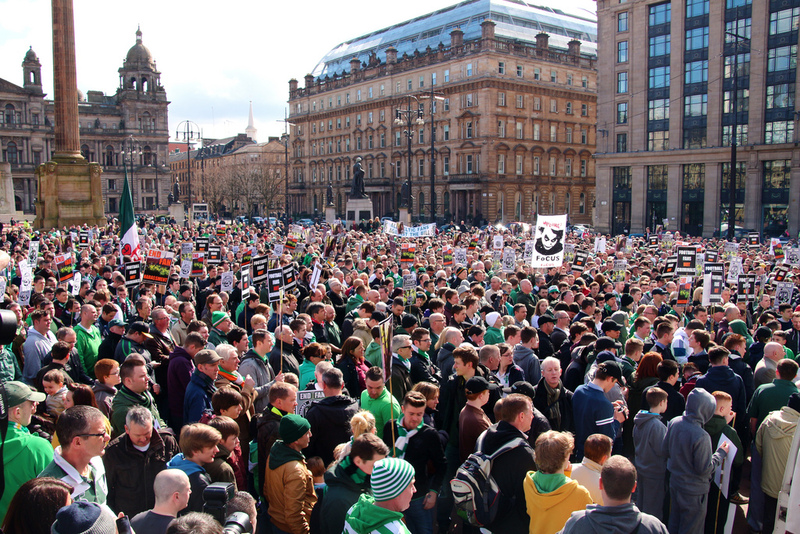 The demonstration at George Square was organised by Fans Against Criminalisation (FAC), an umbrella group comprising the Celtic Trust, the Green Brigade, Celtic Supporters Association, Affiliation of Registered Celtic Supporters Clubs and Association of Irish Celtic Supporters Clubs. The group held an event at St Mary’s church in Glasgow a fortnight ago to gather evidence from those who had been at the Gallowgate the week before. I attended that event and offered my statement. My 73-year-old father was kettled by Strathclyde police that day, on what should have been a trip to Celtic Park for his birthday. We didn’t make it; standing in the rain in freezing temperatures for an hour rendered that unpractical for an elderly man. I took him home instead. At that event, 13 arrests were made as 200 Strathclyde police officers clamped down on the march, organised by Celtic fan group the Green Brigade, whose members say they have been victimised, harassed and put under surveillance by the authorities. Police vans, horses and a helicopter were in attendance at the incident, which police said was in response to an unauthorised march, despite the same officers having policed a banned event just an hour before without a single arrest. This time, Chief Superintendent Andy Bates, Divisional Commander for Greater Glasgow Division, said: “There was no disorder and no arrests and I am delighted by the way in which those who took part conducted themselves. What a difference three weeks makes. There was “no disorder and no arrests” because the police provoke any, even when the fans their ban on walking on the road they stayed well clear. From the scene of the events a few weeks back until the traffic lights at the forge retail park there were no police despite thousand of fans defiantly (and peacefully..yet according to the police statements earlier, illegally) marching to the game on the road allowing only west-bound traffic to flow. They were conspicuous by their absence, in twenty odd years of going to Celtic games I’ve never seen the Gallowgate so devoid of cops. This reveals their reasons for kettling people a few weeks ago as completely farcical and at best highly disingenuous. The argument that no police = no trouble was strengthened yesterday and in my view reveals their behaviour a few weeks ago to be violent, reckless and incompetent and demands an investigation into which police officers in authority made the fateful decisions on that day. A powerful message by peaceful protest was dispatched here and aspirations of justice shall be strengthened as others review this present rally. When any of us are subjected to Govt sanctioned ,endorsed injustice which incorporates physical and emotional abuse our main weapon is restraint from reactionary hostile response. The lack of Police presence,their unjust intervention, due to a numerical increase by law-biding men women and children through non violent civil disobedience, triumphed. It will be very difficult for those media elements to discredit this form of protest by their irresponsible biased reporting. Civil disobedience cannot be discredited as its a democratic right to do so. Law and order is respected and violence from those in authority reveals their biased ,unjust,sectarian,racist agenda`s. Any who support the Green brigade and may not attend through fear of violence shall be more confident in their personal public presence. Chief Superintendent Andy Bate,s comment speaks volumes even though it may not have suited the Masonic establishment`s desires. Alex Salmond`s false representation`s and possible deceitful racial manipulation were also curtailed. His past speeches are an insult to Celtic/Irish/Scottish people`s intelligence. The card he plays is not the one held.